Diplomacy between Iran and the major powers should continue, because open lines of communication will make the Western countries feel better able to live with a nuclear Iran. But the current sanctions on Iran can be dropped: they primarily harm ordinary Iranians, with little purpose. 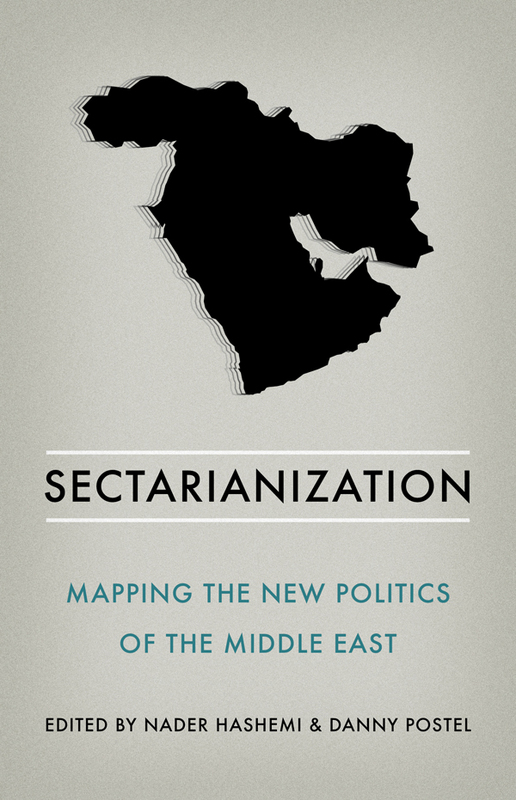 Most important, policymakers and citizens in the Arab world, Europe, Israel, and the United States should take comfort from the fact that history has shown that where nuclear capabilities emerge, so, too, does stability. When it comes to nuclear weapons, now as ever, more may be better. This week I thought I’d describe my adventures with a website called Medialens over a cartoon I recently drew for The Guardian. 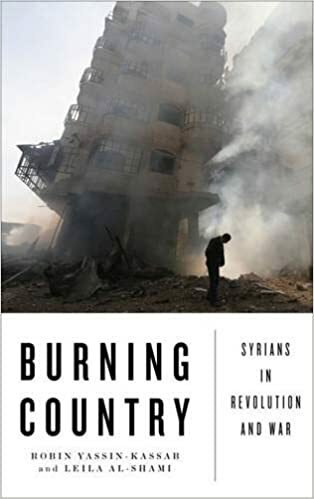 It featured Bashar al-Assad, in the immediate aftermath of the Houla massacre, smeared in blood and pointing an equally blood-stained finger at his own chest. Also depicted were Vladimir Putin, Wen Jiabao, Ban Ki Moon, Kofi Annan, several cowled figures of Death, Angela Merkel and Christine Lagarde lashing a pile of human bones with euro-laden cats-o’-nine-tails and the sleeping form of David Cameron, snuggled up to an enormous cat dressed in a blue pin-striped suit. The thing was captioned “Who? Me?! 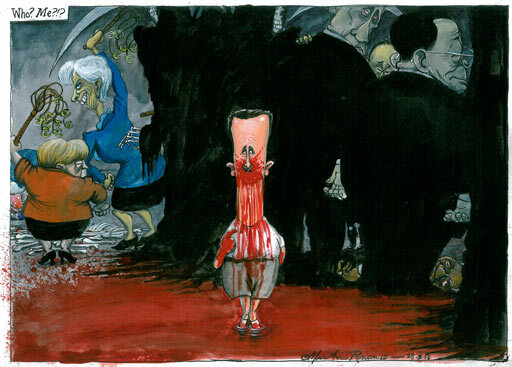 ?”, although it’s by no means clear who’s saying these words, just as it’s not clear whose blood besmirches Assad, whether it’s his latest alleged victims’, from his earlier ones or, for that matter, whether the blood might be his own. 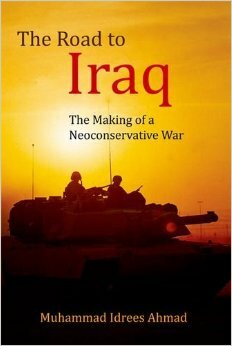 After the infamous babies-in-incubators fiasco, in which Amnesty International helped sell an unpopular war with false claims about specific Iraqi atrocities, one would expect that it would show greater concern for its reputation which in recent year had been rehabilitated somewhat. But as Ann Wright and Coleen Rowley show, Amnesty International’s hiring of a highly dubious Washington insider to head its US operation and its blatantly propagandistic public diplomacy campaigns on Afghanistan suggest cooperation with the CIA to perpetuate a deeply unpopular war. The new Executive Director of Amnesty International USA – Suzanne Nossel – is a recent U.S. government insider. So it’s a safe bet that AI’s decision to seize upon a topic that dovetailed with American foreign policy interests, “women’s rights in Afghanistan,” at the NATO Conference last month in Chicago came directly from her. 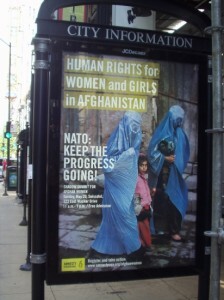 Amnesty International’s “NATO: Keep the Progress Going” poster at a Chicago bus stop.